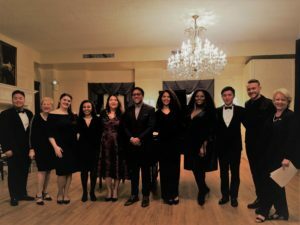 The Gerda Lissner Foundation in association with the Liederkranz Foundation presented the 2018 Lieder/Song Vocal Competition Winners Concert. 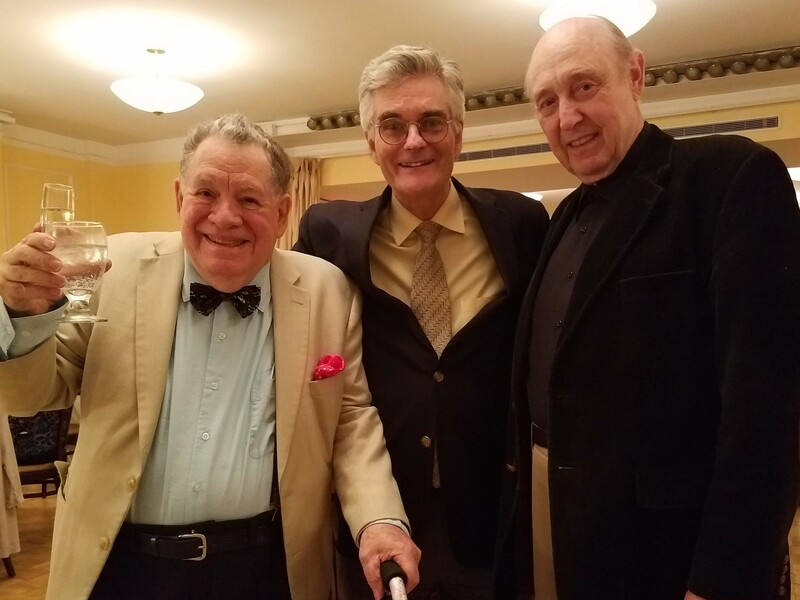 The event was held on Friday, November 2nd at the Liederkranz Foundation in New York City. The Gerda Lissner Foundation has long been a source of assistance and scholarships for young talented singers. 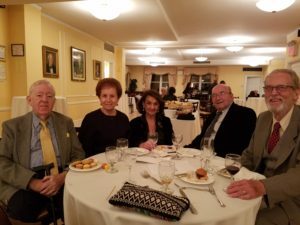 Stephen De Maio President, Michael Fornabaio Vice President and Treasurer, Cornelia Beigel Secretary and Trustee, and Karl Michaelis and Barbara Ann Testa, Trustees who are a part of opera history. Steve De Maio introduced host Midge Woolsey and he received much applause after several months absence. 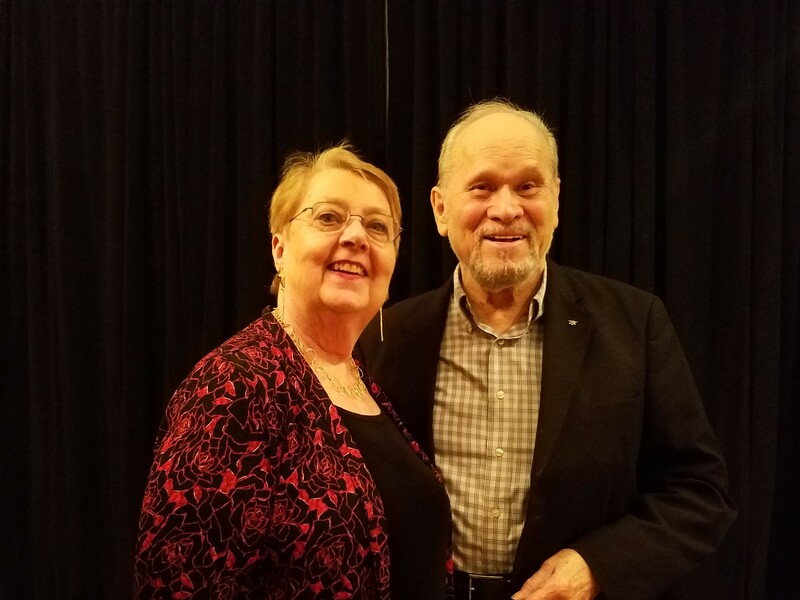 Steve also introduced the gifted accompanist Arlene Shrut. Midge Woolsey, looking exuberant and joyful introduced the first singer, soprano Helena Brown, who sang “Hat dich die Liebe berührt” (If love has affected you) with depth from the heights with her beguiling serpentine soprano which envelopes the listener with its depth, richness, and power. She seemed equally at home in the upper and lower registers of her voice and this enhanced the text as smoothly as a trip at dusk on Schroon Lake in autumn. Ms. Brown can sing either Aida or Amneris – or both – lie in waiting for this talented young lady. She is versatile and has real style! Amanda Lynn Bottoms, mezzo soprano tugged at the heartstrings with “Kdyz mne stará matka zpívat ucívala” (“Songs my Mother taught me”) by Antonín Dvorák. Ms. Bottoms sang with such emotion following the rhythm of this song without overt sobbing, one could hear the passion and conviction in her tone. Many years ago my mother-in-law, Regina Zigman bought me a gift – it was an LP of legendary Spanish soprano Victoria de los Angeles. One of her selections was “Songs my Mother taught me.” It always brought tears to my eyes.”Ms. de los Angeles had a special poignant quality that Amanda Lynn Bottoms brought back with her lovely rendition. Next was Rebecca Farley whose radiant soprano sang “Apparition” by Claude Debussy. Ms. Farley has a beautiful upper register, exotic tonality and an inner spirit that can lead to unlimited possibilities. Alice Chung mezzo-soprano sang “George” by William Bolcom. 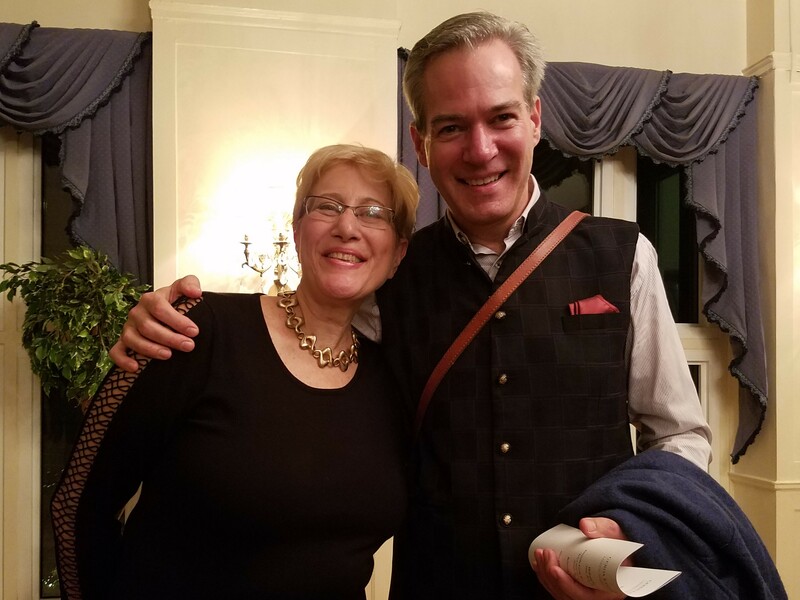 Judy and I saw Bolcom’s passionate opera A View from the Bridge at the enterprising Vertical Player Repertory opera in their Court Street loft in Cobble Hill, Brooklyn. Ms. Chung sang it with insouciance, whimsical tone, good humor, strong dialogue, power and passion and carried us all away with this bedazzling piece wanting us all to hear more! Christine Lyons used her captivating soprano and sang this familiar song “Ständchen” by Franz Schubert with freshness, sentiment and a sprinkling of vocal stardust. The great Danish heldentenor Lauritz Melchior sang this to Esther Williams in the MGM musical Thrill of a Romance in 1944. It is so tender and melodic that it resonates in my mind from that film for over 70 years. Ms. Lyons has a rare power of expression plus a lustrous soprano that should carry her far. 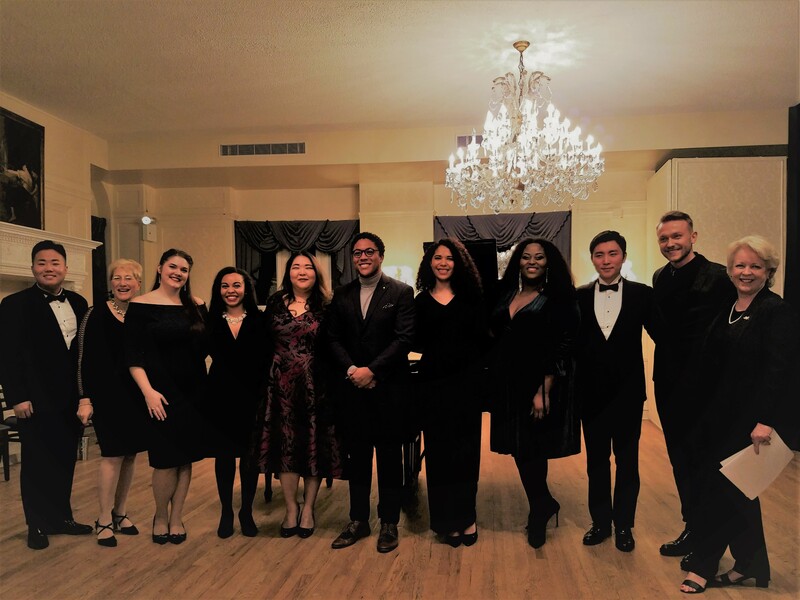 Part Two of the program began with baritone Xiaomeng Zhang from Shanghai, who sang “An die Leier” by Franz Schubert with an abundance of beautiful tone and whetted the appetite for more Schubert. Tenor Dashuai Chen was introduced by the exuberant Midge Woolsey by his choice of singing an ITALIAN song, the well-known tenor selection “Mattinata” (“Morning”) written for Enrico Caruso by Ruggiero Leoncavallo, the composer of Pagliacci. Caruso made a recording of it with the composer at the piano on April 8, 1904, in Milan, and practically every tenor has sung it since. Ferruccio Tagliavini (1913-1995) made a heavenly recording of it in the early 1950’s and on the Voice of Firestone on early television. Tagliavini had a sweet lyric tenor and a resourceful top. Such songs as “Anema e Core” and countless others dazzled the public. I saw him at his return to the Metropolitan Opera in 1962 in an enchanting La Bohème and Elisir d’amore plus a concert at the Brooklyn Academy of Music. These legendary and iconic singers had instantly recognizable voices and personalities that endeared them to the public. That is what we hope for with this new group of talented singers. Mr. Chen sang in a delightful tenor with an Italianate edge emphasizing the high tenor notes that rang freely through the room. In Thrill of a Romance. MGM introduced Lauritz Melchior to its film audience with his face singing a few bars of “Mattinata.” Mr. Chen will not be forgotten since he was one of the great highlights of the evening. As recommended by Midge Woolsey, I googled Joan Sutherland and heard her, a woman, sing a brilliant and delightful “Mattinata” – thank you Midge! Baritone Justin Austin sang “Pace non Trovo” by Franz Liszt. Liszt was always torn between the boudoir and the monks robes and had a lot of passion in his works.” I find no peace” was the inner theme of this selection. A combination of brilliance and despair that had us mesmerized. Justin Austin is a singer of strength and passion. The brilliant accompaniment of pianist Arlene Shrut was the beat of Mr. Austin’s heart. 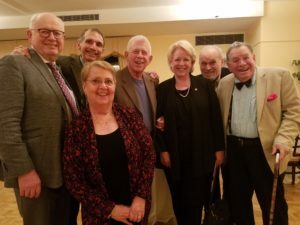 Midge Woolsey, our radiant host exclaimed, “if I could ever be another person, I would be Arlene Shrut!” We second the motion, brava Arlene Shrut! Hubert Zapiór, Polish baritone, winner of the Gerda Lissner award for 2018 sang a song written by Polish patriot, President, and piano virtuoso “Polaly sie lzy me czyste” by Jan Paderewski. Mr. Zapiór is a baritone with strong high notes and a vocally congenial physicality. His voice was reassuring in its versatility from thrilling highs to burnished lows. I thought of the great Polish bass baritone Adamo Didur who sang during Caruso’s time. 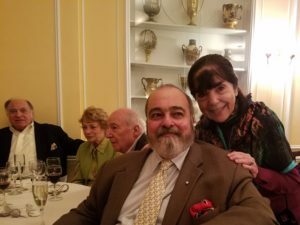 Google his “La Colunnia” also Google soprano Marcella Sembrich whose museum near Lake George at Bolton Landing will fill you with Polish opera pride. I was happy to be seated next to the MetOpera legend mezzo Rosalind Elias, who offered me a mint when something had me coughing. Thank you so much! We also saw Gloria Gari and Lud Mayleas from the Giulio Gari Foundation, Jane Shaulis, Joseph Gasperec, Murray Rosenthal and Philip Hagemann, all from Opera Index; Maestros Eve Queler and Per Brevig with his wife Berit, Export consultant Michèle and Anthony Classe, Alfred and Christine Palladino from the Columbus Club, Deborah Surdi, from the Martina Arroyo Foundation, Glenn Morton from Classic Lyric Arts, Brian Hunter from the Musicians Club of New York, Diana Corto from International Concerts, sculptor Dionisio Cimarelli, Don DiGrazia formerly from the Metropolitan Opera Tickets with wife Chee, and opera lovers Emily Hsiung and Reiko Osumi. The delicious finger foods and wines were sumptuous and we returned to Brooklyn with happy musical memories. It was probably a taxi like vehicle but it was a brightly lit magical pumpkin taking us home from the ball!